After about ten years of hard use my good old Logitech G25 finaaly passed away last week. The clutch stopped working and I couldn't get it fixed, so time to go shopping for a replacement. 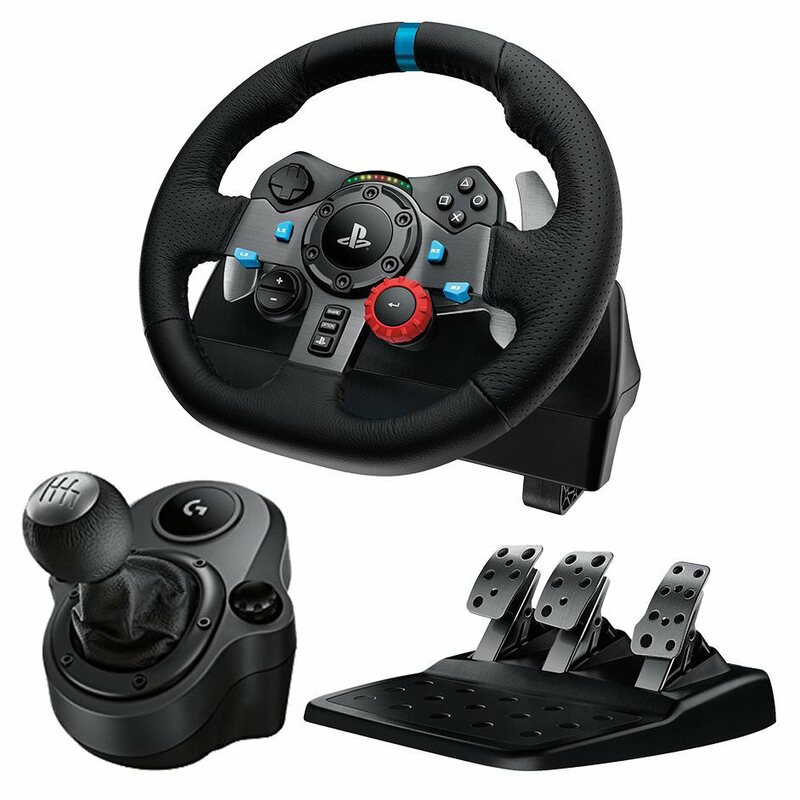 Requirements are force feedback, at least 900 degrees of rotation, three pedals and a shifter unit, and a quick delivery, which leaves the thrustmaster T500 and the logitech G29/920 models. The T500 is a lot more expensive, so another logitech model it is! 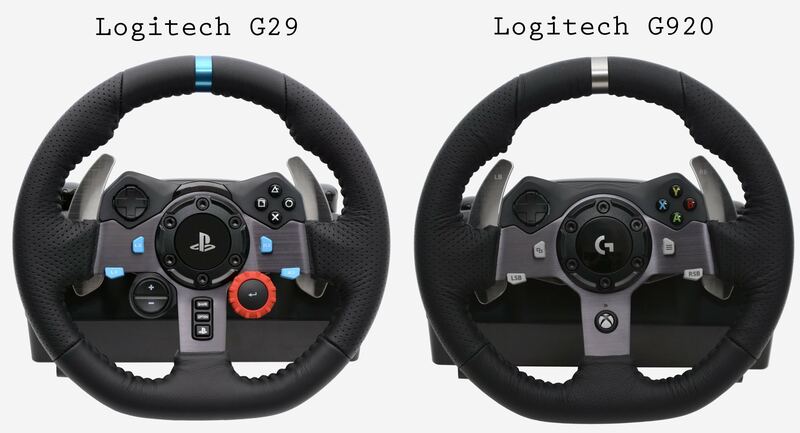 They offer two slightly different models, both will work on the PC, but the G29 also works on the PS3/4 and the G920 is xbox compatible. The extra buttons on the G29 sold it for me, and the G920 has a bright white led on the wheel which (According to reviews) is somewhat annoying. The first downside of both is the lack of shifter, this is a separate purchase, where it was included with the old G25 and G27 models. Thrustmaster also charges extra BTW. Delivery was quick and when I asked for it, so that was nice. All the extra buttons on the steering wheel give a lot of options, and I'm still playing around with those in various sims to find out the best configuration. The big red rotary works great to adjust the brake balance, the lower blue buttons (Which feel a bit flimsy) are for DRS and KERS. The four top right are used to adjust MGU etc, while the +/- adjust turbos. The three center ones control TC and lights. It's good to have those buttons, because there are none on the shifter unit anymore. The D-pad top left cannot be configured in AC, but works to control the pit menu. The shifter lights on the steering wheel are a nice addition, they are just visible in the lower periphery. The shifter itself feels great, quite stiff and well guided, not nearly as loose as the old model. The pedals look the same as the old model, but the brake feels very differently, with a much more realistic progressive action. Downside to this is that if you apply a lot of braking force, the entirely box slides away! A stay put mat solved that problem though. I might have to cut another part to go under the steering unit as well because it slides a bit around even though I can't tighten the screws any further. The feeling is still slightly different than the old G25, but I guess it's the same when you buy a new car, except I can adjust settings in game. Overall I'm quite happy with the G29, lets hope it lasts another ten years! That's the wheel I have got as well, although no shifter. A step up from my old Driving Force GT wheel. When I bought Assetto Corsa about 6 months ago, I got the Logitech G920. Two things I wish were different about it. The white flashing light doesn't bother me, but I wish there was a way to turn off the wheel going full speed from one side to the other every time the computer is turned on. The other is the hardness of the brake pedal. If you Google the G920, there are many complaints about it. There is a hard rubber ball inside the spring, many people take the pedal assembly apart and remove the ball. This of course voids the warranty on it. I decided to leave the ball in until the warranty expired. After about 250 hours using the setup, the brakes are a whole lot better, the rubber ball seems to have softened up, one thing I noticed is my lap times have gotten much better now that the brakes work as they should. You don't realize how much being able to brake later before going into a turn effects the lap time as much as your speed and handling. The steering wheel moving left and right at start up is part of the calibrating process, and the G29 does it quite softly compared to the old G25. That thing moved like it could chop a hand off if was accidentally stuck between the wheel and the base! After a few hours I'm starting to like the brakes; less easy to lock up but still enough control. It does require more force on the pedal though. The 'feel' is more realistic IMHO, compared to the almost linear travel of the pedal on the G25.